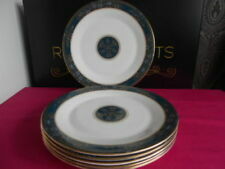 Royal Doulton Rondelay 8 inch Salad plates x 8. IN GOOD CONDITION. SOME SLIGHT SCRATCHES. SLIGHT WEAR TO THE GILT. SEE PICS FOR HELP WITH CONDITION. 1 cup has a tiny nick on rim. All rest in super condition. Lovely modern design. Royal Doulton Rondelay Lidded vegetable tureen. Never been used only ever been in a cabinet. Royal Doulton Rondelay Pattern H5004, this pattern was produced between 1970 until 1997 and is now discontinued. 1st Quality. Great to be used as a sugar bowl or a trinket box as it has a lid. Lovely sugar bowl by Royal Dolton in the Roundelay pattern. We are only passing on the costs associated with getting the item to you safely and in one piece. Excellent Condition. 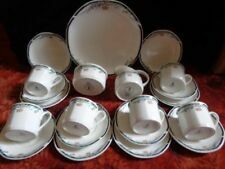 Royal Doulton Rondelay 6.5 inch Side/Tea plates x 8. Royal Doulton RONDELAY. A Soup or Cereal bowl. Complete Gold Trim. Gorgeous tea set from Royal Doulton. 1 x milk jug - height 4" width 4.5" approx. Set includes. Rondelay Design. White and pale green with gilt/gold trim. Dinner plate. Fine Bone China. 2 x Royal Doulton Rondelay H5004 Eared Cake / Bread Plate 10.5"
Rondelay Design. Salad plate. White and pale green with gilt/gold trim. Fine Bone China. 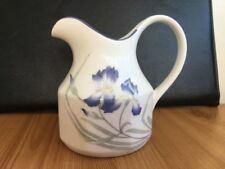 Royal Doulton Rondelay Large Creamer - NEW ! In As New Unused Condition. Royal Doulton Rondelay Cake Plate. Otherwise In Excellent Condition. Quality China At The Right Price. AS PER TITLE AND IMAGES. 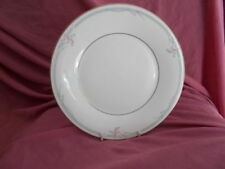 New listingRoyal Doulton Rondelay 10.5 inch Cake plate. 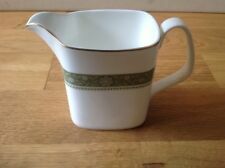 Royal Doulton Rondelay Pattern H5004 ( 1 Lidded Sugar Bowl ) 1st Quality. Royal Doulton Rondelay Pattern H5004 this pattern was produced between 1970 until 1997 and is now discontinued. Royal Doulton Rondelay 10 1/2 Inch Cake Plate - H5004 - NEW ! Royal Doulton Rondelay Cake Plate. In As New Unused Condition. Rondelay Pattern. 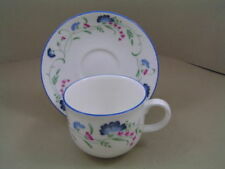 Royal Doulton Fine Bone China. 'RONDELAY'. ROYAL DOULTON. 4 X DESSERT / SALAD PLATES. 1ST QUALITY. BACKSTAMP: PER PHOTO. Royal Doulton Rondelay Cake Plate. In Near Mint Condition. 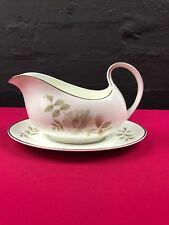 Made by Royal Doulton in the Rondelay pattern. I have for sale this attractive lidded vegetable tureen. Royal Doulton Rondelay. 8 x Tea / Side 1st quality. In very good condition, gold good, look unused. ROYAL DOULTON RONDELAY. A Dinner Plate. Rondelay Design. White and pale green with gilt/gold trim. Fine Bone China. ROYAL DOULTON RONDELAY 6 X DINNER PLATES 10.75"
Lovely condition 13 1/2" Long. Royal Doulton Rondelay 10.5 inch Cake plate.